Lazy Bear Lake - Bear Camp Cabin Rentals. "Lazy Bear Lake"( Formally Known as Dancing In The Moonlight) is a charming log cabin that sits at the mouth of a freshwater lake in the beautiful Wears Valley area. The view from "Lazy Bear Lake" runs the entire length of the lake and its tranquility and beauty guarantees a vacation memory to last a lifetime. Bring your fishing poles to fish in the catch and release pond just out your front door or bring your outdoor activities to enjoy the nice large, level yard on those days you would rather just relax at the cabin. This 2 bedroom, 2 bathroom cabin sleeps up to 4 people and is 2 levels. There are 5 steps to enter the cabin, but when you do, you will be taken back by all the beautiful wood interior, a wall full of windows overlooking the lake and the open floor plan, with the living room and kitchen being in the same room. Relax and unwind on the genuine high-quality leather sofa while watching your favorite show on the Flat screen TV or watching the fish jump in the lake. Curl up on those cold, winter nights in front of the gas fireplace and enjoy a cup of hot cocoa. This cabin offers a fully equipped kitchen with stainless steel appliances and a separate dining room with a table that will accommodate 4 people comfortably. Adjacent to the living room and kitchen is the master suite with a beautiful custom-made King bed, Flat screen TV with your own private bathroom that has a walk-in shower and a gorgeous stone waterfall Jacuzzi tub to enjoy after a long day of sightseeing or hiking the trails in the national park. Also, located in this room is the stack-able washer and dryer for you to use during your stay. Upstairs in the loft area overlooking the living room is another beautiful King size bed where you can enjoy the spectacular view of the lake, Flat-screen TV, and your own private bathroom with a walk-in shower. There is also a sit-down arcade game with 2 chairs on this level for your enjoyment. After a long day at Dollywood, enjoy the bubbly, private hot tub, which is in a screened in porch, to soak all your cares away. Grab your morning coffee and relax in one of the rocking chairs on the spacious covered deck, overlooking the view of the freshwater lake or the beautiful wooded setting that surrounds you. "Lazy Bear Lake" sits on a level 1 acre lot that maximizes the enjoyment of your vacation destination. Located just 10 minutes from the heart of Pigeon Forge and is close to all the area attractions. There are no narrow roads to get to the cabin and when you arrive you will find a large level yard and comfortable parking for up to 2 vehicles. The beauty and peacefulness of "Lazy Bear Lake" is guaranteed to provide every guest a vacation memory to be savored throughout the year. So if throwing a fishing line into the private freshwater lake or just rocking on the front porch and enjoying the tranquility of the lake is what you are looking for then "Lazy Bear Lake" is the perfect place for you. So what are you waiting for? Book this cabin today!!!!!!! This cabin is NOT pet-friendly. Another great Spring break! Lazy Bear Lake is a great location to hit the parkway or hangout at the cabin and enjoy the scenery. We really enjoyed fishing and the wildlife around the cabin. The cabin is pretty much as described, but the kitchen is small. If you plan on cooking at the cabin you may need to bring cookware as the quality isn’t great and there are only a few pieces. The staff at Bear Camp Cabins are always helpful and friendly. 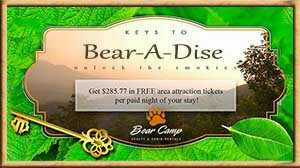 This is our 3rd stay with Bear Camp and we won’t hesitate to book again. Everything was wonderful!!! We cant wait to book the cabin again! Very beautiful cabin! Great secluded yet close to everything cabin with everything we needed! The lake was beautiful with the wildlife and the views. Had a great birthday weekend will be back for sure! Office staff were very pleasant and very helpful even had a courtesy call to make sure everything was ok! Wonderful stay and very clean in cabin. We will try to come back next year. The cabin was wonderful, our family enjoyed the small but comfy atmosphere. This cabin was fabulous. The location was ideal; far enough outside of Pigeon Forge to feel private and secluded, but close enough to enjoy all of the attractions. The lake was a bonus; my husband and boys enjoyed fishing and I enjoyed sitting on the deck watching or reading. The cabin was the perfect size for our family of four. It was clean and thoughtfully decorated. We thoroughly enjoyed our stay! We appreciated the affordable rates and the ease of booking. The free attraction tickets were a huge added bonus. Thank you, Bear Camp Cabin Rentals! Everyone was very helpful and polite. No problems at all. Will definitely recommend and use this company again. Very helpful with any/all questions. The cabin was exactly like the pictures showed and it was clean and welcoming. We hated to leave.